Home » How can I record better audio with my Smart Phone or Tablet? Using an external microphone will greatly improve the audio recorded with a smartphone or tablet. These devices face the same challenges that most DSLR camera’s face. First, there is just not enough physical space for a larger microphone and second, the primary purpose of the device is not recording audio, so the audio circuitry is not the best available. There are a number of different external microphones that will work with these devices. In most cases you will want to use a directional microphone so your audio matches the video you are recording. You don’t want your video showing your child’s soccer game while the audio you hear is the parents sitting behind you. A directional microphone will often be referred to as a shotgun microphone, so that would be your most likely choice. There is, however, one additional decision that must be made. Do you want to use the external microphone only with your smart device or do you want it to be “universal”? For a microphone that will be used strictly for your smart device, you can search Google or Amazon for “microphones that work with smartphone”. 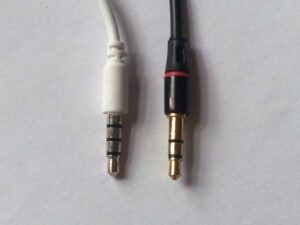 If you want a more “universal” microphone, or if you want to use a microphone you already own, you can purchase a “Y” connector that will let you plug in a standard microphone, as well as headphones (or earbuds). These adapters are available at larger electronics stores or on Amazon. As is usually the case, very inexpensive microphones will probably not provide the same quality of audio as a more expensive unit, so be sure to check the reviews before purchasing. If you decide to use a condenser microphone you will most likely need to purchase a device that can convert the XLR connector of the microphone to the small 1/8” (3.5mm) connector of your smart device, as well as provide the phantom power that condenser microphones require. One such device is the iRig PRE from IK Multimedia. It is the smallest, and least expensive device we have found for this purpose. It provides a convenient way to connect the XLR microphone to your smart device, provides the power that the microphone requires, and also provides an external amplifier for the microphone signal. Using an external amplifier and reducing the amount of amplification provided by the smart device will usually provide higher quality audio, just like DSLR cameras. In addition to your microphone, you will also need to install an app on your device that allows you to monitor the audio that is being recorded. The default software in many devices does not allow such monitoring. It is very difficult to get good results without monitoring the audio that is being captured. The makers of the iRig (mentioned above) have free apps available for audio monitoring and controlling the device. Another option is to use the Cinema FV-5 app, which I use on my Android phone. While these devices work well, be warned that you want to turn the gain control on the devices all the way down, as well as reducing the gain of your recording app, when you first plug in your microphone. Once your microphone is connected, then turn up the gain in the external amp, and app, as needed. If the gain of the device’s app, or the external amplifier, is too high your audio will sound distorted. We mentioned at the beginning, that you will likely want to use a directional microphone for your smart device. This usually means that a shotgun microphone is your only choice. If, however, you want more directionality (selectivity) in the audio that you record, or if you want to capture from a great distance (greater that six feet), you may want to consider using a Sound Shark with your smart device. Yes, you can use the Sound Shark with your iPhone, iPad, Android phone, or Android tablet. You can actually use the Sound Shark with any device that has a jack for an external microphone. If you don’t already have a lapel mic to use with the Sound Shark, you should consider purchasing a mic with the TRRS connector. While we have not tested this mic, it should work well with the Sound Shark. If you want a more universal microphone you could consider purchasing the Sound Shark Premium Kit (which includes a Sound Shark and a high quality lapel microphone) along with the microphone/headphone splitter mentioned above.